No new rides to report on, but we've still spent plenty of quality time together. There's been some amount of de-hairing going on daily. I don't know if it's a just thoroughbred thing, but Val doesn't shed out in clump or patches, and he's not visibly extra hairy. None the less, hair fills the air and covers me and the floor when we're done. Yesterday my friend D and I did our several miles of speedy walking in the campground, then headed up to the barn for some fun and refreshment. TGIF. After barn chores were done, and Val's hay + warm mash bucket were set up, we took him out for a bit of grazing. I've been increasing his time on grass by five or ten minutes every outing - though he'd prefer to eat til his sides split. He's been hinting each evening by shunning his fresh hay and instead stretching his lips waaaaaay under the electric fence to pathetically grasp the few pitiful strands of green he can reach, punctuated by well timed looks, in case I didn't get the point. GRASS, GRASS, GRASS, GRASS, GREEN GREEN NOT DRY TASTY GRASS P-L-E-A-S-E!!!!!!!!!!! When we came to the fork in the road - left to the Bermuda Triangle, right to the small arena grass patch - I asked Val which way he wanted to go, and let him choose. Bermuda Triangle it is! D and I sipped some delightfully cold adult beverages while he ate his fill. Cowboy threw his usual OH MY GOD I CAN'T SEE MY FRIEND fits - commonplace and therefore totally ignorable. After making our rounds, we headed over to the small arena. Val got a tad pushy, so we did some in hand work... halt with me, walk with me, please focus on me and not the grass Mr. Man... He did beautifully. It was fun to show off his lovely movement to my friend. A few more mouthsful as a reward, then back to the barn. Besides a new-found enjoyment of beer, Val really dug my friend. He followed her around like a puppy, and loved on her. Not in the potential treat source way, but real affection. So far, she'd the only person he's been that way with besides my Dad, whom he adores. We hung out until dark, and plan to make it a monthly date. Val surely enjoyed our company - he was super calm and content. I must create more time to hang out with him - no demands, plans or schedule - just companionship and company. It's so good for both of us! Great post. Nothing better than quality time just hanging out with your friends - human and horsey. My mare used to drink soda out of the can and was known to grab other people's sodas as they walked by at shows. I do think that I heard she drank beer too before I bought her. Glad Val is over the Bermuda Triangle fear and I live this grass vs. hay situation now. I spend too much time picking up hay that has been ignored. I think I am so stupid to put more out the next day, but we humans take a long time to get a lesson! This post cracked me up. I knew a horse who would pop the tab on a can with his lip then guzzle the beer. Hang out time is great bonding time. I'm really enjoying doing that with Jackson. 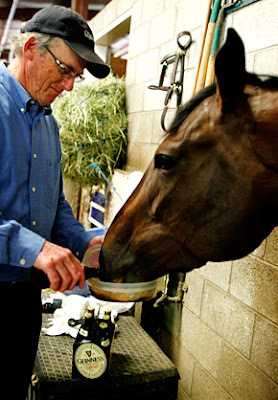 I love to just hang with my horses and have them come over and interact with me. Good for you and Val for defying the Bermuda Triangle, he's so smart now he knows there's nothing scary about it anymore. 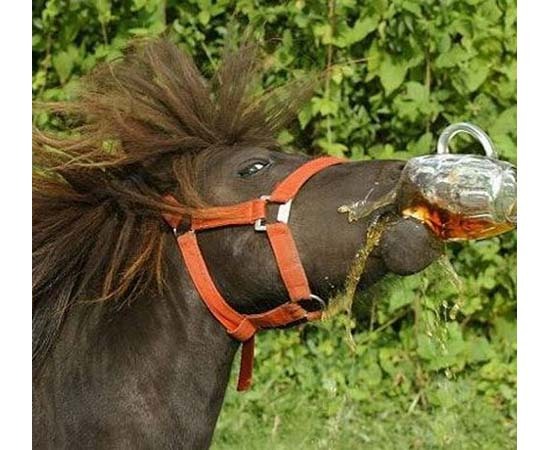 I've seen horses drink beer apparently they love it. One of our horses used to like Doritos and another Mellon likes Fruit Loops. Great way to spend time. Horses, friends and beer. :-) One of the police horses at the Royal Newfoundland Constabulary loves Pepsi out of the bottle. You've reminded me that it has been a long while since Spider and I just hung out and had some beers. Too long! We need to do that! Maybe I should of gotten beer for Howard's birthday instead of mints. Lol. 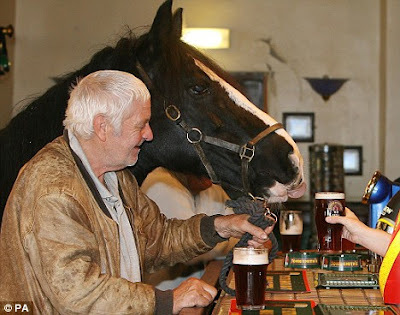 Sounds like a perfect occasion - frineds, horses and beer. It's so nice just to hang out with our horses for fun and not work. 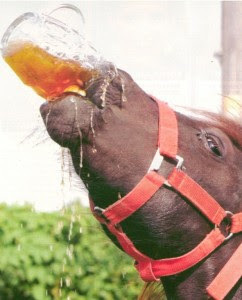 I think that horses enjoying beer is... Well I don't want to say "common," because I'm not sure how many horses are even given access to beer, but I think a lot of horses that are given access to enjoy it. My horse was given beer on his 21st birthday, and he dutifully drank it. My horse prefers soda. If someone has a soda he gets in their business about it, and he's knocked down sodas several times to lap them up once they've spilled.